Suppose the corp draws a Gutenberg, and installs it in front of R&D. The runner then runs R&D. What happens next? The runner might try to break it using their killer. This is absurdly expensive; a 6-strength sentry is no joke. Even if they're running the mighty Garrote, it's still going to cost 5 to get through this ICE. The runner might try to beat the trace. This, too, is extremely difficult; for a runner with 0, this is a minimum of 7, and the corp can always boost the trace to make it even more difficult to avoid. So for most runners, it's going to be far easier to simply take the tag. They can always clear it laterfor +2, and the risk of a floating tag is sometimes acceptable if they aren't relying on resources for economy and have their Plascrete Carapace up. As with any tagging ICE, if you're running it, you want to have a threat to back it up. Scorched Earth is the classic, of course, but Closed Accounts/Universal Connectivity Fee can effectively end games as well. 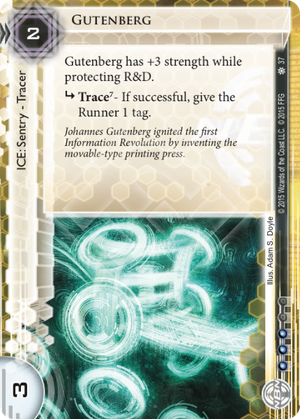 But what if you don't get Gutenberg on R&D? Well, in that case, it's significantly easier to deal with; 1 to break with a Mimic, 2 with a Garrote, and 3 with either a Creeper or Femme Fatale. This isn't going to be enough to deter a runner, but it will drain their money a little bit, and for a 2 rez that's an okay deal...although Hunter or Shadow would be more taxing, even though the traces are weaker.